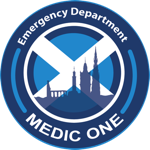 The Medic One half marathon team successfully completed the Aviemore half marathon on Sunday 12 October 2014 – a very memorable weekend! Most of us arrived in Aviemore the day before the race, allowing us time to register and to eat the obligatory free pasta which was vaguely edible! The weather on the day of the run was cold, clear and sunny. All 17 of the team met at 8am to catch buses to the start line. At the start, Jen and Sam Beattie joined us and took photographs of ‘Team Purple’. Sam was very encouraging to all of us after he had cycled the course the day before (and raised lots of money for Medic One – thanks Sam!). The start of the race was at 10am – we were all excited if somewhat nervous! The course was absolutely stunning and I would recommend it to you all – beautiful views of the Cairngorm hills, Loch Morlich and various forests. We all completed the race with lots of encouragement from marshalls and crowds as we approached Aviemore. Jon Carter came first out of Team Medic One with an excellent time of 1 hour 37 minutes. Still, it’s not all about winning is it?! I want to thank all the Team for their commitment and effort over the last few months – not just with training and doing the run itself but also for their enthusiasm and fund raising efforts. It was a really memorable weekend and I think will go down in the history of Medic One fundraising events. The first of many more! I also want to thank all of you for donating so generously to Medic One and sponsoring the Team. We are still collecting cash but think we have raised about £7000 for Medic One! Congratulations to you all! If you haven’t got round to donating yet, the website is still open for donations or you can write a cheque to ‘Medic One Trust’ or give cash to Liz or Angela. Older PostLast chance for Medic One Ball tickets!